How Can Happiness Survive When Duty Clashes With Desire? Sheetal Prasad has it all: youth, beauty, wealth and education. But when this modern Indian woman surrenders love for honor and marries into India’s most glamorous ‘royal family’, these very advantages turn against her and she is stripped of her freedom. Meet the Dhanrajs — a powerful family bound together by a web of lies where infidelity, greed, secrets and hidden identities lurk beneath the lush tapestry. The Dhanrajs have plenty to hide and will do what it takes to mask the truth from the world. As Sheetal peels back the layers of deceit, she confronts a haunting reality and is threatened by the blazes of passion she ignites. “Not to be with me. To tell me. You came to tell me you’re marrying someone else. And you expect me to do nothing?” That’s exactly what she did expect, because society required a woman to marry the man her parents chose for her. Being forced into a marriage she doesn't want, Sheetal Prasad abides by her parents conquest to give her away to a prestigious family. Leaving behind the man she loves, for a man she can barely stand to look at. 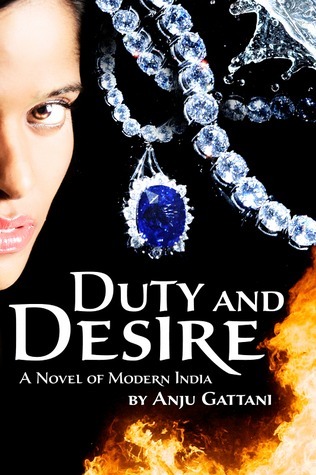 Forced into life of her duty as the wife of Sanjeet Dhanraj, India's own royal family and her desire to live her life the way she wants, Sheetal goes through a journey in discovering who she is. We're first introduced to Sheetal who is breaking things off with Arvind, the man she loves. Coming from an Indian background, Sheetal has no choice in the matter of who she marries. Her parents have already found a bachelor suitable to take their daughters hand and that man just so happens to be Sanjeet Dharaj, of India's prestigious royal family. I understood where Sheetal was coming from when she gave up the man she loved to marry someone her parents set her up for. She was torn between doing what she wants and following her traditions and not disappointing her parents. This book is a roller coaster all it's own. At first we have Sheetal despising her husband, and won't give in to him or his family and their "rules" in the slightest bit, and next thing you know she's pining after him. Which was definitely a roller coaster for me. I wanted to scream at her to not take his crap and stand up for herself and stand up to her parents so that she could be happy and not miserable. Which kept me reading, I wanted to know if Sheetal would finally blow up and take advantage of her situation and turn tables. I liked that even though you're thrown into the modern world of the Indian culture, you're still given the grounding principles of the culture and lifestyle and lead by a rope to try and understand why things happen the way they do. Yeah, it might seem far fetched to our normal lifestyles and love lives, but you're definitely pulled in and able to differentiate between duty & desire. The characters are definitely their own person, they each stand out and play a role that help carry the story. What I didn't like about this book, is that I think Sheetal was very weak as a person at points. She kept giving excuses for why people did what they did. But I liked that in the end she got it together and finally came to the point where she matters and that she needs to put herself first and focus on what she wants, her desires and not fall victim to everyone's crap, regardless of traditions. This book was pretty good, I was a bit iffy about starting it as first, but as I read I became hooked, despite my urge to scream at the main characters. If you're up for an adventure into the lifestyle of the Indian culture & seeing through the eyes of a modern Indian woman and her struggles with duty and desire, then I would definitely recommend this book to you. Anju was born in India but grew up in Hong Kong. Her Indian upbringing and British education worked together to strongly influence her writing. Anju’s fiction explores how the distinct mindsets and traditions of different cultures permanently shape people’s values, thinking, and behavior patterns—for both good and evil—despite the “leveling” effects of 21st century communications and travel. Anju earned a Bachelors degree in English Literature in India and a teaching degree in the United Kingdom. She has also studied creative writing. Anju has lived in Singapore, Australia, India, New Jersey and Connecticut. She now makes her home in Atlanta, Georgia, with her husband and two kids. Anju is a columnist for a multicultural magazine in the USA. 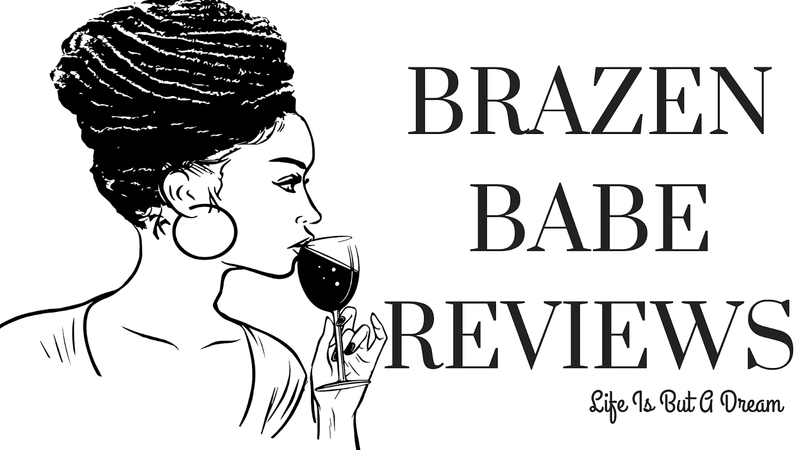 She is also an avid guest blogger, who loves to share her experiences in health and fitness, food, self-empowerment and great fiction reads. 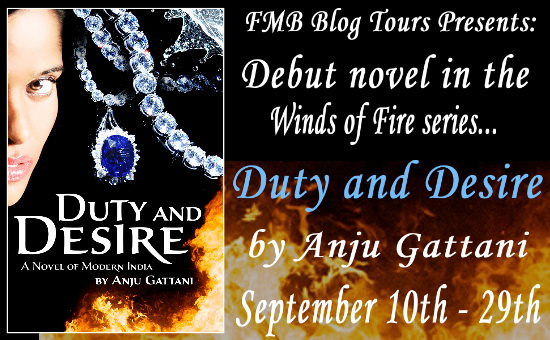 Duty and Desire is her first novel.